Revelations about Donald J. Trump's charitable foundation have questioned the candidate's use of charity money for personal gain. 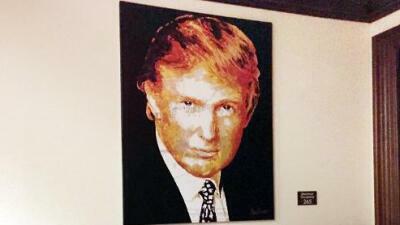 A mile from Univision News headquarters in Miami, Donald Trump’s portrait, purchased in 2014 with $10,000 of money from his charity, hangs on a wall at the Trump National Doral Resort. Last week, Washington Post reporter David Fahrenthold reported that the portrait, a four-foot-tall painting of Trump by Miami Beach-based artist Havi Schanz, was purchased with money from the Donald J. Trump Foundation during a fundraiser auction at his Mar-a-Lago Club in Florida. That could violate IRS rules. Since then, mystery has surrounded the portrait’s whereabouts. “If Trump did not give the painting to a charity — or find a way to use it for charitable purposes — he may have violated IRS rules against 'self-dealing,' which prohibit nonprofit leaders from spending charity money on themselves,” the Washington Post reported. On Tuesday night, Univision anchor Enrique Acevedo booked a room at the Trump National Doral Resort to check out a TripAdvisor photo, posted by a hotel guest in February, that closely resembled the mystery portrait. Trump’s campaign has argued that the charitable donations of the Trump Foundation are legal. But experts consulted by the Washington Post say Trump may be in violation of IRS rules that forbid mixing charity with business. On Tuesday, Fahrenthold reported that Trump spent $258,000 dollars from his foundation to settle business lawsuits. The portrait in question was purchased during a gala that raised money for Unicorn Children's Foundation, a Florida charity that helps children with developmental and learning disorders, according to the Post. Jon Secada performed at that gala. Instead, “it is arguably enhancing the experience of playing golf there,” he explained.